Home mortgage application rates have been on a decline for the third week in a row. However, the overall picture is still mixed. Yes, buyers are acting more rationally by choosing to lock-in fixed rates. Inventories are up, perhaps fueled by sellers fearing a downturn. Yet, new home sales are also up 13%, hitting a new record while existing home sales are down m/m but up y/y. Meanwhile, the economy grew a blistering 4.3% in the quarter, despite higher energy prices and the hurricanes, while so called "core inflation" rose 1.2%, less than estimated, and down from the previous quarter's 1.7%. What about our local market here in Boulder, CO? Overall home sales in the city of Boulder, as noted in my earier post, were flat y/y for October and down m/m. Note, sales normally drop in the fall and winter months. It's part of our seasonal pattern. What about Building permits? 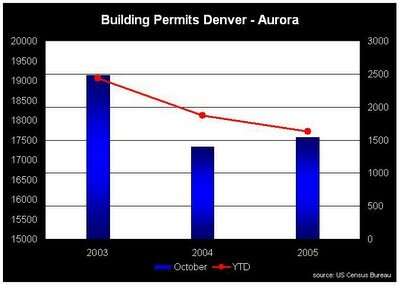 We can't get specific data for Boulder (yet), but can look at the Denver-Aurora metro area where an overall downward trend continues, but permits are up 10% m/m from 2004. See chart below (click for a larger view).